Forgive me, for I am here to destroy your insecurities. Your excuses. 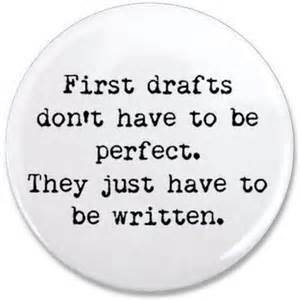 The lie that suggests your first draft must be perfect. The illusion that great copy is born in a single moment of white-hot inspiration. I want to destroy those things so you can get down to the business of writing. And that begins with first drafts. So when a writer of his caliber makes a statement like that … do you think you will be any different? You’ll make your copy adequate in the first rewrite. Good in the second. Great in the third and fourth. More likely in the fifth and sixth. And beyond. But not today. Today is the day to write like a lunatic … or an invalid with a crayon crushed between his teeth. Just like our heroes. Barricade the door. It must be just you, the ink, and the paper. Work in a physical and mental condition that makes you want to write. Get there by all means possible. Allow your imagination to go to weird places. Nothing is off limits. You can clean up your mess later. Break every writing rule known to man. It’s OK if it reads like a letter from a lunatic. Steal stylistically from other writers, as all great writers do. Keep your bottom in your chair until you are done. Once finished with your first draft, leave it alone for days — if not weeks.